Euro Motors, the exclusive importer and distributor for luxury automotive manufacturer Jaguar Land Rover in the Kingdom of Bahrain, announced the launch of its two new websites, each of which are segregated to individually cater to its prestigious brands, Jaguar and Land Rover. The new Euro Motors websites, www.jaguar-bahrain.com and www.landroverbahrain.com, which went live on Sunday, the 1st of October, 2017, have been exclusively designed to ensure that consumers get the best digital experience possible while on their journey to find out more information about a Jaguar or Land Rover product that they may be particularly interested in. 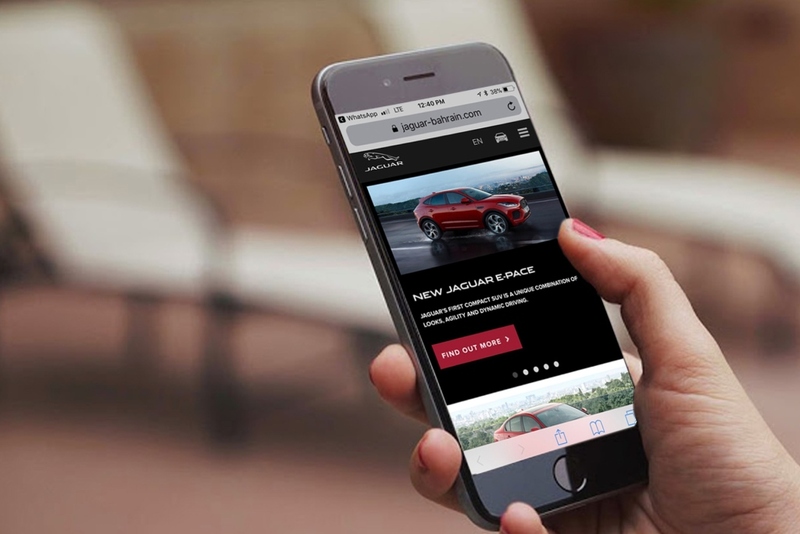 The new sites are integrated with programmatic dynamic campaigns, which means that based on customers’ behaviour on the websites, Euro Motors Jaguar Land Rover can now deliver customized content to them at all the possible “touch points” they have been recognised to have with the brands. The websites include a fully-revamped customer friendly user interface with highly interactive content that allows users to experience dynamic and personalised specs and pricing. Jaguar Land Rover is the first manufacturer to introduce a detailed pricing configurator across nine countries in the region with local currencies on their websites. And the revamped websites integrate this highly beneficial facility and allows customers to purchase vehicles online through Euro Motors Jaguar Land Rover, while being able to view the latest financial offers available in the Kingdom of Bahrain, in a user friendly manner, each integrated with the respective vehicle model. “With the total transparency in pricing that we have now introduced, which is a first in the region, we have greatly redefined the steps involved in the purchase of our vehicles in order to make the process much easier. Our capacity to provide such customized offerings reiterates our status as the most customer-oriented dealership in the Kingdom of Bahrain, both in terms of accessibility on our digital domain and our physical presence, truly distinguishing us from our competitors. Through these pioneering initiatives, we both exemplify our evolving efforts in our commitment to our customers, and continue to justify the faith placed in us by Jaguar Land Rover Limited with our consistent provision of exemplary services and outstanding products, in line with the very essence of excellence that the Jaguar and Land Rover brands have themselves inherently portrayed throughout their illustrious histories,” he added. Visitors to the sites can now engage with different digital tools such as a consistently updated vehicle price configurator, through which they can opt to purchase their selected vehicle online as well as book both their vehicle service appointments and test drives through the new websites.Visitors can also browse through the whole range of Euro Motors’ APPROVED Pre Owned vehicle inventory and check the latest promotions Euro Motors Jaguar and Land Rover has to offer . This gives prospective customers the opportunity to book their vehicles, for either purchase or test drive purposes, and offers current owners the option to book their vehicles’ service appointment online as well, all from the comfort of their homes. To know more, call the Euro Motors Jaguar Land Rover showroom on 17460460 or follow the latest posts about Jaguar on Facebook at Euro Motors – Jaguar Bahrain or on Instagram at @emjaguarbahrain and about Land Rover on Facebook at Euro Motors – Land Rover Bahrain or on Instagram at @emlandroverbahrain. Additionally, to get further information, follow up to date Jaguar tweets on Twitter at emjaguarBahrain or Land Rover tweets on emlandroverbh.